Lemongrass chicken with rice and local veggies. Beef tacos with cilantro lime rice. Chicken noodle bowl with honey garlic soy sauce and local veggies. Barbecue pulled chicken sandwich on a local bun. Nope, this is not a list of specials at a downtown San Luis Obispo restaurant. These are just a few examples of the lunches that'll be served up to elementary students in San Luis Coastal Unified School District (SLCUSD) cafeterias this fall. 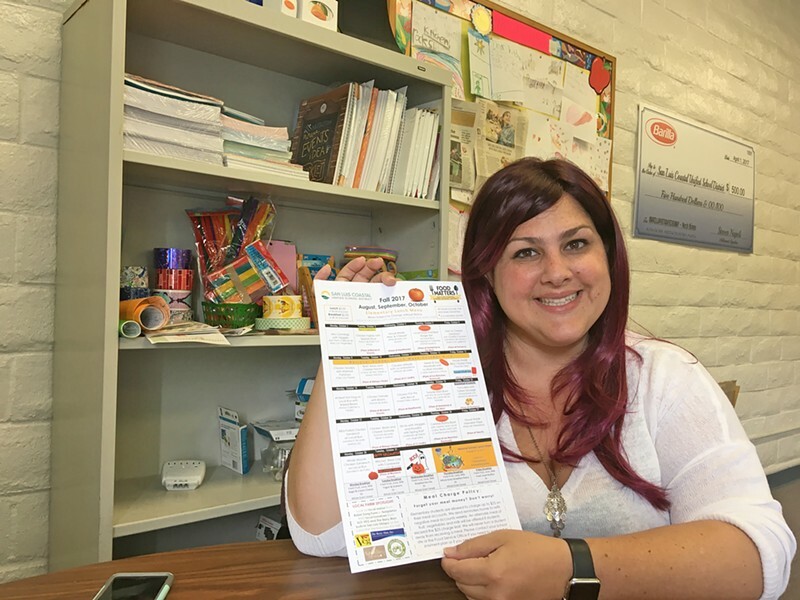 "Almost every day of the week, we have local things on our menu," said an enthusiastic Erin Primer, director of food services at SLCUSD, in her office at Laguna Middle School. "Our romaine lettuce is grown in Oceano. We use the Achievement House over by Cuesta College for their hypertonic lettuces." Every Thursday, students at all SLCUSD campuses will be able to buy a school meal that's completely sourced from California. It's called "California Thursdays," a statewide program launched by the nonprofit Center for Ecoliteracy in 2014 and currently implemented in 71 California school districts. SLCUSD joined the list of districts last year and hosted California Thursdays twice a month. This year, the district is expanding to a weekly California Thursday. Lucia Mar Unified School District (LMUSD) is also taking up the program this year, preparing to serve up burgers with patties from the Central Coast's Larder Meat Company, held together by fresh buns cooked at Edna's Bakery in SLO. "The whole idea is to source as much as you can from your local community," Primer explained. If you're thinking that this sounds a hell of a lot healthier and more sophisticated than the packaged pizza and cup of ramen that you got as a kid, you'd be right. SLCUSD's new culinary motto, now imprinted on an official logo, succinctly describes the 180-degree shift in institutional mindset: "Food Matters." The evolution of school food today is a byproduct of two key factors: the growing national obesity crisis (one out of every five children is obese according to the Centers for Disease Control), and stricter federal rules regulating school food. The Healthy, Hunger-Free Kids Act of 2010, legislation championed by former first lady Michelle Obama, took effect in 2012 and required school food programs to abide by a plethora of new nutritional rules and restrictions—such as prohibiting white bread, trans fats, and fried foods, and mandating allocations of fruit. "It's much more regulation," Primer said. "But, there wasn't really any regulation for many, many years prior to that." NEW LEADER Erin Primer, director of food services at San Luis Coastal Unified School District, revamped the district's food program to serve more locally sourced food at a higher quality. Some school districts around the country perceived the new rules as stifling and burdensome. Those officials, teachers, and parents complained that their students were refusing to eat the whole grain rolls, fruit bowls, and other healthier options offered at school. "I hear a lot of, 'Kids don't like healthy food,'" Primer said, frowning. "No, kids don't like crap. Kids don't like garbage. It's not an issue of healthy and unhealthy as much as it is about the quality of food." While other districts have floundered under the new system, local districts like SLCUSD and LMUSD, preferred to look at the standards as an opportunity to exceed them and offer even better nutrition and quality, which they're convinced students and their parents will come to embrace. "A lot of adults think kids only like pizza, but that's because it's just what they encounter all the time," said Laurel Goins, the food services director for LMUSD. "Kids always want to try new things. You have to make food friendly and fun." When Primer joined the SLCUSD in 2016 from the Millbrae School District in the Bay Area, she felt that the district was still serving too much cheap, processed food even though the SLCUSD was complying with regulations. "We had 15 different kinds of packaged, processed pizza," Primer laughed. "It was pizza sliders, pizza sticks, pizza in a square, pizza in a triangle." The sad truth, she said, was that students didn't even like the pizza. FRESH AND LOCAL The salad bar at the San Luis Coastal School District's cafeterias now offer locally grown produce from across San Luis Obispo County. "I asked, 'Which one is good?' And they're like, 'None. None are good,'" Primer said. "So, why are we serving it? If it's not good, we shouldn't do it. It's that simple." Under Primer and district chef Anthony Au's leadership, the SLCUSD launched California Thursdays and started forging more partnerships with local farmers and food producers. Their most recent connection is with Los Osos' Larry Kandarian, who farms faro. "We're launching it with carnitas," Primer said. "We do a lot of nutrition education and taste testing. We put the faro out last school year, and we do taste tests with the kids. ... If kids can see the whole food process—that somebody grew this for you, somebody had to put in their time and energy and love to get this to your plate—now there's respect in the food system. If the kid understands that, they want to eat it." 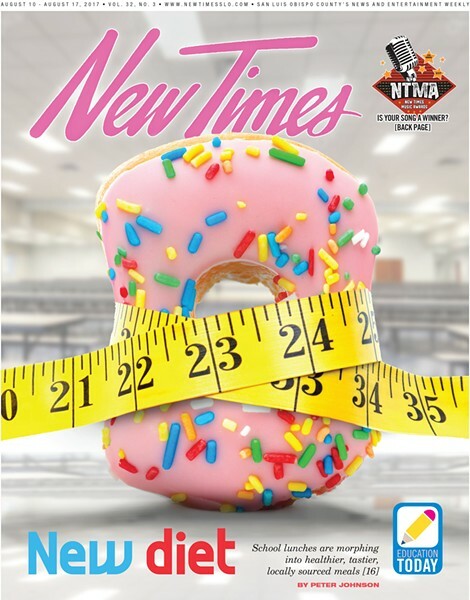 Making the shift toward a healthier cafeteria model has brought its share of heartache. Gone are the days of allowing doughnuts at school and serving chocolate milk on demand. At SLCUSD elementary school sites, chocolate milk is allowed only one day per week—and it's fat free—even though the chocolate milk demand far exceeds regular milk demand, according to district data. Complaints about the rigidness of school food regulations has brought U.S. Agriculture Secretary Sonny Perdue to announce in his first week his intention to lift several of them, including restrictions on sodium, white bread, and fat-free milk. That won't change SLCUSD's attitude about it. "Sonny Perdue said he's fine with having us do 1 percent flavored milk. We're not," Primer said. 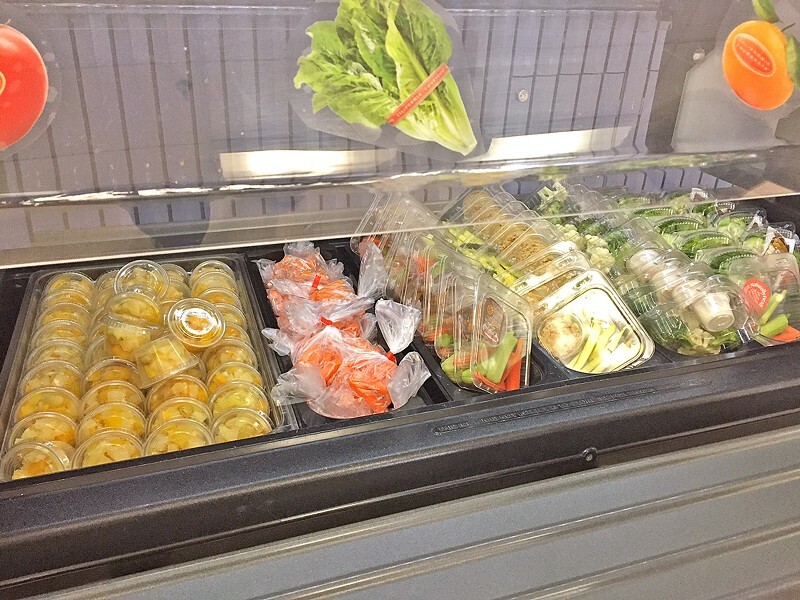 Fundamentally restructuring the SLCUSD food department last year took a leap of faith from the school board and community. With student participation on the decline in previous years, the department found itself in a $300,000 deficit after the 2015-16 school year. A new strategy that involved investing more money for a higher quality product was risky. But district parents like SLO resident Shannon Klisch, a nutrition educator with two children at Bishop's Peak Elementary School, fully supported the gamble. LINING UP San Luis Coastal Unified School District food service worker Jane Nichols demonstrates to first graders how to cup beans for the salad bars at the district's central kitchen. "I think it is vitally important. My kids participate," Klisch told New Times. "It's a social justice issue. If we don't all participate and support this program, it's marginalized." And that's one of the elephants in the room about school lunch programs. Historically speaking, they're geared toward low-income families with children who need free or reduced lunches, Primer said. With that funding guaranteed by the government, a school program has little incentive to invest in higher quality food that would exceed their funding. "What happens is sometimes operators think, 'If I'm going to get money either way, what does it matter what I serve?'" Primer said. "That doesn't yield the best results. Cheap food, crap food, kids see through that." SLCUSD's new paradigm is already having an effect on student participation. Primer said demand for the meal program went up as much as 50 percent at some campuses on California Thursdays. 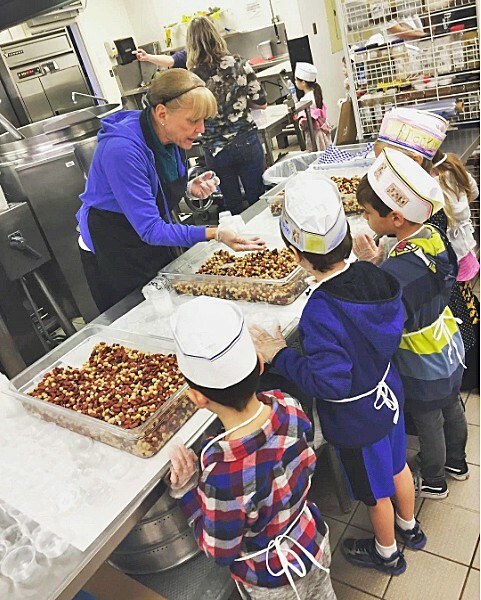 At LMUSD, Goins is forging a path similar to SLCUSD's—partnering with local growers for a better product—and is working on getting the word out to parents and kids that "cafeteria food isn't what it used to be."